A flagellum, also called undulipodium, is a whip-like structure used for locomotion, for feeding or other purposes. Almost all organisms have flagella (at some stage in their lives). We humans have them in our bodies. Even our own spermatozoa can be regarded as flagellates. All these flagella have a similar basic design. Only Bacteria have flagella of a totally different type. 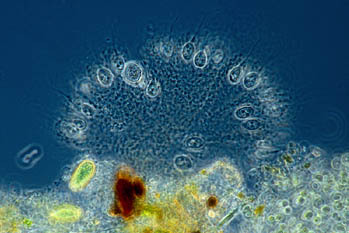 The cilia of Ciliates are just shorter versions that act different. A cilium beats like a small pedal and generates a sideways motion. Most undulipodia act more like a propellor, wavy motions push or pull an organism in a forward direction. This small flagellated Peranema has a long flagellum that only moves at the front end almost like a propellor. An interesting flagellated protist to study is Euglena. Some of its many features are shown here. Euglena can become so numerous it may turn the water of a pond bright green. 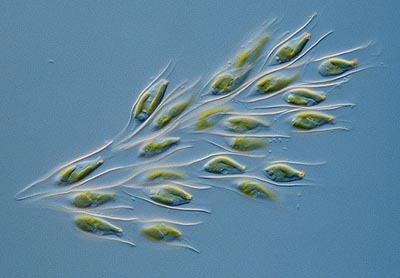 Apart from using their undulipodium Euglenids are also able to locomote by flexing their bodies and changing their body shape, so called Euglenoid motion. Euglenids have the ability to lose their chloroplasts. If you would keep Euglenids in the dark they start feeding on organic matter and may loose their pigment. There are many species without chloroplasts. A single nucleus contains the genetic material. Bright green chloroplasts transform light into energy. The energy is stored in storage grains. A long flexible undulipodium used for locomotion. Near base of the flagellum we find a round contractile vacuole. It helps the organisms to remove surplus water. Because living tissue is saline, organisms living in fresh water take up water. A red eyespot is clearly visible. In fact the real light sensitive organ is the swelling near the base of the flagellum. The red area makes sure only light from one direction is detected. Since the light sensitive organ is directly connected to the flagellum, Euglena is perfectly able to swim towards a light source. 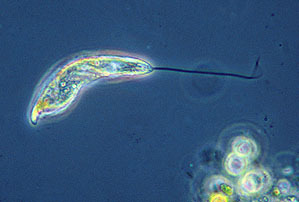 Most flagellated protists have two or even more flagella. Often we see one flagellum trailing behind like a kind of rudder. Flagella and cilia are transparent and thin so it is not easy to see them with a microscope. Special contrast techniques like dark field illumination or phase contrast help to make these structures visible. 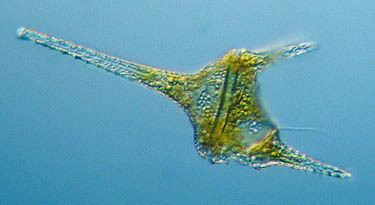 Click to see a drawing of a Dinoflagellate. It is not just protists that use flagella for locomotion. Even our own spermatozoa have a flagellum. Not all flagellated forms are free swimming. Many live a sessile life. Spongomonas is a colony of flagellates living in a gelatinous matrix. they use their flagella to gather food. It is relatively easy to make a so-called 'earth culture' for several kinds of photosynthetic protists and algae, including Euglena. Put a small amount of garden soil in a bowl of water and cook it until it is sterile. Place the bowl behind a well lit window but not in direct sunlight. Now add a bit of pond water or choose an algae by using a pipette. Make sure you don't add algae eating species like water fleas. The nutrients from the earth are enough to grow millions of euglena or other interesting species. For those who live in the warmer areas of the world there is a very interesting place to find truly amazing protists. Inside the gut of termites live flagellated protists that help the termites to digest wood. Click to see what lives inside the gut of a termite.